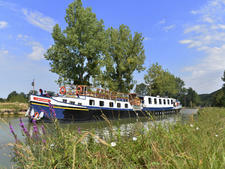 The beautiful Anjodi is a television star, one of two European Waterways' vessels to have been featured in a Rick Stein special on barging in the south of France. 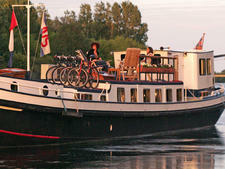 Built in 1929 to transport grain between Amsterdam and Paris, the 100-foot long, 16.6-foot wide Anjodi was converted in 1983 and has served as a hotel barge ever since, with a passenger capacity of up to eight guests. 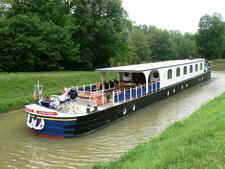 During most of the season, the barge travels the Canal du Midi from Marseillan to Le Somail. 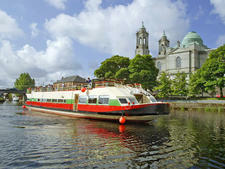 Special golf and wine chart cruises are also available. Anjodi's four guest rooms range in size from 87 to 98 square feet, cozy to be sure, but beautifully appointed with dark woods and bright Provencal fabrics. 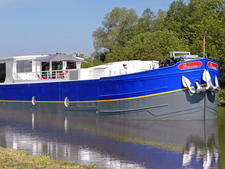 The staterooms each have at least one porthole and are air-conditioned (there is central heating throughout the vessel). 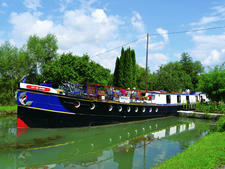 Each also has a closet, reading lamp and tiled en-suite bathroom with toilet, sink and shower. Amenities include a hairdryer, soap, shampoo and shower gel. All current is 220 to 240 volts (North American appliances need converters) with the exception of the bathrooms, which have a 110 outlet for shaving only. The saloon is comfortably appointed with dark hardwoods, large windows, cheery drapes, two sofas, a coffee table and a dining table for eight. The room also contains a bar, a small library and a stereo with CDs. 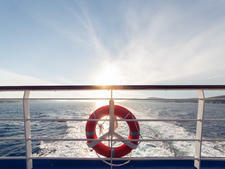 The sundeck, though, is where this floating inn really shines. It's furnished with padded wooden chairs and loungers, umbrellas, tables and a large hot tub/whirlpool -- and on this route, the outdoor deck is useable all season long. Snacks and wine are often served on deck, as is the occasional al fresco meal. Meals are served in a single seating, with breakfast and lunch offered buffet-style. Continental breakfast includes breads, croissants, yogurt, cereal, fruit, coffee and tea. Lunch is typically breads, cold-cuts, salads and cheeses, with the occasional hot entree or soup. The meal is served with wine and finished with dessert and coffee. Dinner is an elegant candlelit affair, with regional cuisine paired with wine, desserts, cheeses, coffee and liqueurs. The dress code at all meals is resort casual, except for the Captain’s dinner on the last evening, which requires cocktail attire. 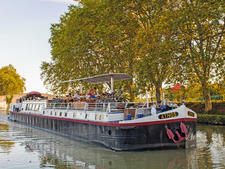 As on all of the hotel barges in European Waterways’ fleet, Anjodi is an all-inclusive product, with wines, soft drinks, bottled water, beer, liquor and liqueurs, as well as all onboard meals and snacks, included. (Certain vintages of wine and Champagne -- except for the Welcome Aboard greeting -- are not included, but can be provided for a fee.) 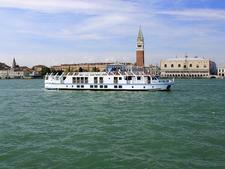 Shore excursions, usually lasting from two to four hours, typically take place once a day; all entry fees are included with your cruise fare. Optional activities, such as golf, cost extra. 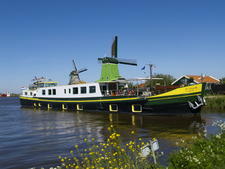 An air-conditioned eight-passenger VW mini-bus follows the barge’s route and is available at designated times for transport. 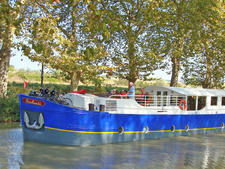 Excursions on Anjodi’s regular route include stops at vineyards for wine tasting, guided tours through the medieval fortified city of Carcassonne, and visits to Narbonne, once home to Visigoth monarchs. 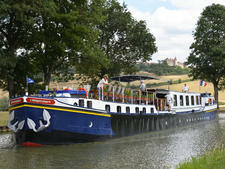 Passengers can partake of a special on-shore dinner arranged at an auberge in Beziers. Anjodi carries six touring bikes, some of which are 18 speed. 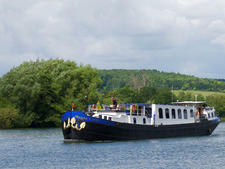 Because the boat travels so slowly, it’s easy to debark at a lock and catch up with the barge later. Board games, boules and binoculars are also available for guest use. 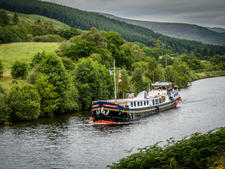 Theme charters include golf, tennis, wine appreciation, cycling, walking and family weeks. 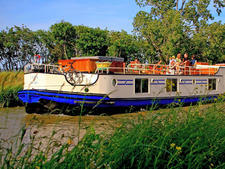 From time to time, individuals can find available cabins on themed charters; check with your travel professional. 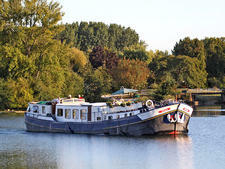 The barge has four crew members: a skipper (captain), chef, hostess and tour guide, all of whom speak English and French. Gratuities are discretionary and typically average between four and seven percent of the fare paid, given to the Captain for distribution.